Perhaps you have seen a reproduction of this painting or even the original that resides in the Mauritshuis Museum, The Hague. Done in 1632, it is one of the earliest works Rembrandt signed with his first name. 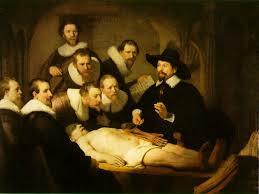 Shades of modern medicine, it’s said that many doctors paid the artist to be included. I felt very much like a live version of the man on the table when I took part in Grand Rounds at a school that teaches acupuncture. Let’s skip over my reason for seeking treatment and just say that I wanted it badly enough to participate in a teaching situation until I could land an appointment with one of the main practitioners. Ther e I was (fully clothed) lying face up under fairly bright lights with about thirty students, not one Asian among them. I’ve had acupuncture several times before, always with a Chinese practitioner and have had results ranging from amazing to none. The jury’s out on this one as I’m told it will take a few treatments to have an effect–or not. 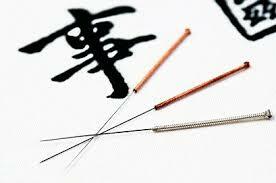 Both my primary care doctor (Japanese/Chinese) and another physician (Indian) applaud adding acupuncture to the regimen. How far we’ve come from the days when non-traditional medicine was summarily dismissed or raised eyebrows. Today, acupuncture is so in vogue it’s used on cats and dogs (and, for all I know, horses and other animals). Full disclosure: in previous acupuncture experiences, the needles were totally painless. In this case, I felt a few as they were inserted but it was in no way unbearable or even truly “painful.” If pain results in gain, I’m all for it. 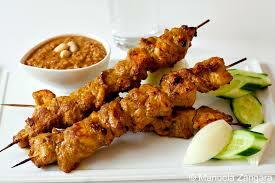 Thinking about needles….voila, a recipe for chicken satay on skewers. If this makes you feel squeamish, stop here. Otherwise, consider this a pretty quick, no-fail appetizer. In blender, combine peanut butter, chutney, lime juice, 1 tablespoon soy sauce, garlic, pepper flakes, 1/4 teaspoon salt, and 1/4 cup water; blend until smooth. Set aside. Thread each chicken piece onto a skewer (fold the pieces slightly as you work so the skewers go in and out of the meat). Place skewered chicken in a shallow dish; season with with salt and pepper. Drizzle oil and remaining tablespoon soy sauce over chicken; turn to coat. Heat broiler or grill to high (if grill, lightly oil grates; if broiler, place on foil for easier removal.) Grill chicken until cooked through, about 3 minutes per side. Be sure it’s not pink inside. Transfer to a platter and serve with chutney sauce for dipping. Meanwhile, enjoy your turkey leftovers–almost my favorite part of the meal! This entry was posted in Uncategorized and tagged chicken, Chinese, needles, Turkey. Bookmark the permalink. Acupuncture has been used in the West for at least 40 years, starting with numbing mouths for oral surgery. It’s been employed in China for at least 5,000 years. I’m all for it although I’ve never used it but know people who have been helped by it. Astute article and I enjoyed it Mari, especially how you introduced it with Rembrandt’s painting. Mari–as always, I so enjoyed your Pins and Needles post! Even though we had talked about this treatment, your quips made me laugh out loud. Happy travels! Our sweet baby dog Jet has his first experience with acupuncture earlier this week. It was interesting because the tiny needles were used to inject homeopathic remedies to relieve and calm various things. Jet has long been getting chiropractic adjustments and now we are complimenting with the acupuncture. Not sure if we will end up with an amazing result or non — I’d be happy with even somewhere in the middle. Hope he’s doing better. I’d read about it but you’re the first pet family I know to have actual experience. Also, our old Newfie, has such a tough time arising, that acupuncture, from those glowing testimonials, is something we must try – Hopefully better’n the meds he’s on.